The name is a bit of a misnomer, the book is less about the art of choice and more about the psychology of choice brought to life through her many experiments—particularly related to consumer choice. Iyengar is the researcher behind the famous jam study, in which shoppers could sample either 6 or 24 different varieties of jam at a grocery store, which led to six times more purchases when fewer jams were available. As a marketer and lifelong student of consumer behavior, the content of this book was not new to me, which was both a little surprising and a little disappointing. 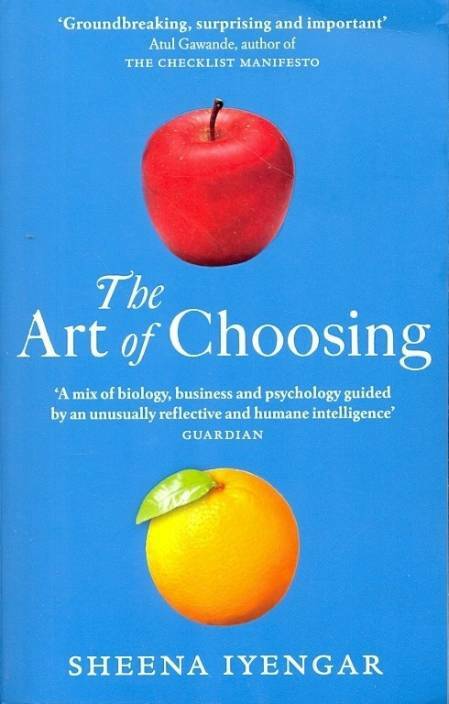 However, I highly recommend The Art of Choosing to readers interested in learning more about the human decision process and influences through the eyes and research of a prominent social psychologist. Ask yourself how you arrived at a particular preference: Were you overly influenced by a vivid image or anecdote? Did you discard an option too quickly because it was framed as a loss? Is it possible that you imagined a trend or pattern that doesn’t really exist? Try to find reasons not to choose what you’re immediately drawn to. Gather evidence against your opinion. And while she acknowledges that this is often difficult to do during the decision process, the exercise can be equally useful after a choice has been made to better understand influences and biases. She asserts that we can combat decision-making biases through vigilance, persistence, and a healthy dose of skepticism. The Art of Choosing is an interesting, easy read—chock full of fascinating experiments from the researcher that made every consumer products marketer in America reconsider their longstanding strategy of revenue growth through product line extensions in the form of new flavors, forms, colors, ingredients, or packaging sizes.